Hong Kong Island hotel is a list of different kinds of hotels put together, but divided them by districts. In each district, I will briefly describe the location, transportation and nearby Hong Kong attractions. But remember...some districts cover quite a big stretch of areas. Just comparing the distance from one hotel to a tourist spot may not apply to another hotel. My family and/or I stayed in some of them that you can simply click "Our review" to see our comments. This part of the Hong Kong island is pretty remote. MTR may not reach to this area for at least another 5-10 years. The closest Hong Kong attractions are the Floating Restaurant (The Jumbo), beaches, Stanley Market and the Ocean Park Hong Kong. It is very close by the capital of Hong Kong, Central. There is one of the best luxurious shopping mall, the Pacific Place. The Hong Kong Museum of Tea Ware and the Seal Stone Museum are within walking distance. You can take a bus to the Hong Kong Victoria Peak tram station. This list of Hong Kong island hotel covers quite a big stretch of area. For instance the first 2 hotels are much further away from the center of Causeway Bay. One great thing about this district is that it is surrounded by restaurants, shopping malls and markets. Transportation is super convenient. This is the "capital" of Hong Kong. Many commercial activities are going on in this area. You can get to these places easily, such as the Hong Kong Stock Market building, Hong Kong Star Ferry Central Pier, ferries to Lantau Island and Lamma Island. Of course, there are several malls for luxury shopping. This is another big area. The YWCA and Ovolo 2 are actually located in Mid-Level. But that also belongs to Central district. In other words, these 2 hotel do not have the Hong Kong MTR advantage of convenience. If you love Hong Kong nightlife, you got to check out Lan Kwai Fong. If not, Central will be super quiet at night. During my search, I found that there are at least 3 Hong Kong Island hotels list themselves under "Central". But they are actually not and I re-grouped them correctly in other districts on this page. This is another extensive district. The area is mostly for residential buildings. It is between Causeway Bay, which is a major shopping district, and Quarry Bay, which is a newfound commercial district. Owing to the above reasons, North Point has the advantages of traffic convenience and comparatively low Hong Kong Island hotel rate. A couple hotels below are nearby the Chinese Visa application office. 2 big Hong Kong food districts (coming soon - link to Hong Kong Food District page) are near the Causeway Bay direction. Even you have to stick to the same area due to business purposes, looking for food varieties is SUPER easy. As you can see that a couple of these Hong Kong Island hotels below listed themselves as in Central. But by looking at the map, they are actually closer to Sheung Wan. This district is more like the margin of the capital of Hong Kong. You can check out the Western Market, seal stone shopping and board the hydro-jet to go to Macau. Walking up hill, you can reach many restaurants in the Soho and Lan Kwai Fong areas. There are several places between Central and Sheung Wan worthy of your time to do a Hong Kong history tour. As of right now, this is the last station of the Hong Kong MTR on the western part of the Hong Kong Island. It is going to extend further. But it will be another 5-10 years of work. This is an upper middle class residential area. There are several big commercial buildings housed many well-known global companies' Hong Kong branches. Many Korean and Japanese live here. Most of them are executives of these international companies. A Hong Kong movie star and singer lives here with his family. Nearby, there is the Hong Kong Museum of Coastal Defence and 2 big shopping malls. None of them is as big as Times Squares. But they have great stores for clothes and food shopping. Many hotels of this district are at the edge of other districts, such as Causeway Bay, Happy Valley (where the Hong Kong Jockey Club is), Admiralty and Central. The varieties range from very cheap to 5-star hotels. Due to the above reasons, you can access many Hong Kong attractions, areas for entertainment, Hong Kong nightlife, markets and shopping malls. Of course, you can find many different kinds of restaurants SUPER easy. Traffic is very convenient. But when it comes to MTR, you may find the other station is comparatively closer to your hotel instead of the Wanchai station. Just a piece of advice, before making reservation of any Hong Kong Island hotel in this district, look carefully based on your major activities. This will help you save a lot of travel time back and forth to your hotel. Just by looking at the district name, you knew that it is on the western side of the Hong Kong Island. When Hong Kong first became the British colony, it was a very prosperous place. As time went by, this became one of the oldest districts and waiting for the next re-urbanization. No MTR can reach to this area. Because of all the above reasons, everything is comparatively cheaper here. 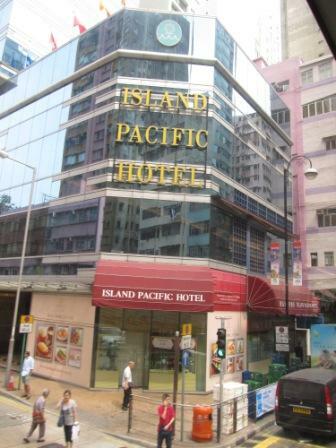 I did find 1 or 2 Hong Kong Island hotel in this district listed the address in "Central". But now, it is in the correct region on this page. Walking up the hill, it is the University of Hong Kong. There are several tram terminals here where you can schedule a Hong Kong tram tour at any time. One very special feature of this place is that it is flooded with stores selling dried seafood, such as shark fins, scallops, sea cucumber, oysters and so forth. There is always some fishy smell in the air. Don't feel disgusted. These stuffs worth thousands of dollars. Stores pay a lot for their insurance. Among all the hotel booking sites, we found that HotelsCombined.com provides the best search and/or comparisons of price and locations of Hong Kong hotels. You can find hotels based on more locations/tourist spots in Hong Kong than any other major hotel booking sites. Many of these tourists spots are also thoroughly introduced in our site where it gives you a good idea of the surrounding area.